Providing a consistent supply of Koi, Butterfly Koi and Goldfish to businesses across the U.S. requires a large amount of land and ponds. 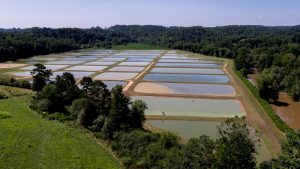 The following is an overview of the farms and facilities that we utilize as we strive to provide you with top quality Koi and Goldfish. Our flagship production facility, this is home base for our Production Team. 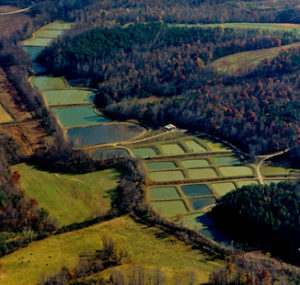 Comprised of 64 ponds and more than 50 surface acres of water, this is ground zero for spawning and raising of koi. The majority of ponds on this farm are standard fin koi, with a few ponds of butterfly fin koi and goldfish spread throughout. Home to our Shipping and Customer Service Team. 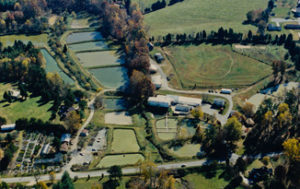 This farm, consisting of 14 ponds, 5 greenhouses and 4 storage facilities, is where all of our koi and goldfish are quarantined and monitored for health issues. All shipments are packaged here, then transported to one of three local airports, or picked up by UPS. 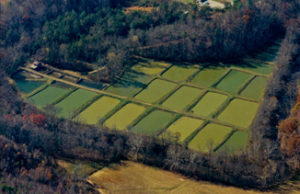 24 ponds and 6 surface acres of water. Big Dan is comprised of approximately half butterfly koi and half goldfish. Ground zero for spawning and production of our butterfly koi. The 34 ponds and 16 surface acres of water here are stocked almost exclusively with butterfly koi, with a few ponds of goldfish. Our main goldfish production facility. The 40 ponds on this farm are stocked exclusively with comets, fantails and shubunkins. 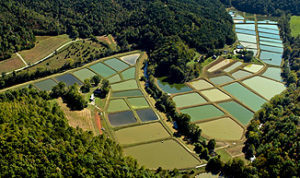 Stocked exclusively with standard fin koi, River Valley consists of 26 surface acres of water spread across 44 ponds.